Applications are due February 20 of each year. This scholarship is open to all members. Interested candidates should submit a one page essay to the Vice President: describing their qualifications, contribution to the club, and character. This scholarship, established in 2000, honors the legacy of Riverside member Charley Osborn. Charley began his rowing career at Brooks (Class of ’73) and Princeton (Class of ’77) and brought his abundant enthusiasm to Riverside in 1982. He served as Vice-President of the Club from 1987 to 1992. From 1992 to 1995, as Trustee, he led the club through the strategic challenge of financial independence as Northeastern University Crew moved to its new quarters up river. Charley loved Riverside. He spent countless hours here out of his love of the people and the sport and to escape from the pressure of completing his doctorate at Harvard. 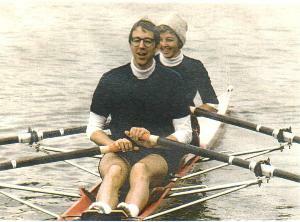 Unusual for married couples, Lynn and Charley rowed and raced a double. As Charley stood six foot six and Lynn five foot eight, their boat required creative rigging, but with Linda Muri’s help, they engineered the double (a wedding present from Charley’s parents) to suit. Lynn enjoyed being pushed around the river by this big guy with a twelve foot stroke. Hard to imagine today, but in 1983, they were handed a last minute entry in the men’s open double at the Head of the Charles and proudly finished in the top half of the fleet. With Bob Cutler’s encouragement they raced and won the mixed double event in the Head of the Schuylkill in 1988. Charley was 33. At the age of 42, Charley was diagnosed with Amyotrophic Lateral Sclerosis (Lou Gehrig’s Disease). After four valiant years of steady atrophy, he died in 2001. In Charley’s honor, Riverside established the Osborn Scholarship to be awarded annually to a member of Riverside who demonstrates qualities that most resemble those of Charley i.e., a commitment to the club through volunteer service, pride of membership, and good sportsmanship. The scholarship covers one year of membership dues. Eligibility/Selection Criteria: It is awarded to a Riverside member who demonstrates exceptional service to the club. While need is a consideration, club service and good sportsmanship are the deciding characteristics. In general, one Osborn Scholarship is awarded per year; however, the club reserves the right to award none or more than one in any given year, depending on the applicant pool. Application Process: The request for applications is emailed to the club each year approximately 8 weeks before membership fees are due. Applicants can be self-nominated and must submit a one-page essay by email to the Secretary describing their qualifications, contributions to the club, and character; and including any other factors for the Award Subcommittee to consider. Selection Process: Applications are reviewed by a subset of the Membership Committee, selected by the Head of the Membership Committee, which then makes a recommendation to the Board. All applicants will be contacted by the Award Subcommittee one week after the submission deadline. The final awardee will be recognized by the President via email to the club membership. Lynn Osborn and Jamie Ames will present the awardee with the award in a brief ceremony at the March membership meeting, and the awardee will also be recognized at the Riverside Stripes Gala. Post-award Requirements for Awardee: Each awardee will be expected to meet with Lynn and Jamie to discuss an alumni-relations and funding project to be conducted during the award year. The goals of the project will be for the purposes of alumni networking and an avenue for fundraising. Funding Process: The Osborn Scholarship will be listed as one option on the Annual Appeal, allowing contributors to donate specifically to that fund. However, additional fundraising will still be required.